CSM is a consortium association operating in Tuscany in home interiors, furniture, interior furnishing, RV (recreational vehicles) interiors, yachting interiors and related sectors. It was established in 1982 to offer local businesses support in terms of innovation, promotion and professional training. It is administered by a Board whose members represent the economic promoters of the consortium. The fact that all trade associations can thus give their contribution to the identification of the aims and strategies of the consortium represents one of the most significant and peculiar aspects of the management. It is thus possible to focus in the same direction experiences, functions and knowledge that are “per se” not homogeneous. CSM is leader of Distretto Interni e Design_dID (www.distrettointerniedesign.it ), the Tuscan centre related to innovation in the interiors’ system. dID performs the function of spreading the culture of innovation among the sectors of reference and an intermediary for technology transfer. dID offers advanced and qualified services in relation to strategic issues for the competitiveness of individual companies relative to product, process and market through the development of strategic research and development projects within the framework of regional and European calls. Animation of the District activities are planned in order to organize the cooperation between companies, enterprises and research system, public and private – matching supply and demand for innovation; organizing, sharing and dissemination of strategic information to assist enterprises in economic intelligence perspective; marketing facial district to promote the participation of new companies or bodies; the organization of seminars and conferences on reference topics. The activities managed by CSM can be split into three main categories: promotion and internationalisation, innovation and training. 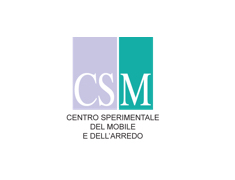 From the time it was established, Centro Sperimentale del Mobile has made INNOVATION one of its main targets of intervention. CSM has developed a progressive capacity for building a unitary strategy which unites various entities in the effort to achieve innovative growth of the Tuscan woodworking, furniture and furnishing sectors. Hence the need to unite the various entities within the sector to focus attention on formal-technological-organisational INNOVATION, with the aim of increasing the sector’s competitive edge, taking action to improve overall quality, the efficiency of its production factors and the ability to communicate and integrate with global markets. Training is a strategic activity for CSM. CSM is defining an integrated plan of training able to act at several levels on strategic figures within the enterprises (entrepreneurs and manager, executives, managers, responsible departments with particular attention to the roles more directly linked to innovation’s processes). It is possible to postulate the creation of a Training Centre for Interior Design, as coordination of training facilities, on the Tuscan territory, working on the sectors of reference. CSM is a part of national cluster related to smart living technologies applied to living environments.